The first scene of Christianity’s passion play opens against a backdrop crowded with various characters, many instrumental and all instructive in its success. To grasp the complex and dynamic world over which the Christians settled and ultimately triumphed, one must first survey the social and religious elements which helped and hindered it along the way. Of those, the foremost is, without doubt, the people of Rome themselves, especially their theological choices and preferences at the time that Christians entered the picture. The earliest belief-systems that can be identified as distinctively Roman are connected to the land. The Indo-European settlers of the area around Rome worshiped primarily agricultural figures, pragmatic abstractions of their various struggles to carve out a livelihood in the wilderness. One such divinity was Robigo, a goddess who averted plant rust—for farmers, a natural force certainly worth cultivating—but as Rome expanded and urbanized, Robigo along with many of her agricultural kin were put out to pasture, so to speak. The same nearly happened to the early Romans’ principal deity Mars who was originally associated with vegetation and could easily have passed into oblivion as well. Instead, however, when later Romans began to militarize, Mars managed somehow to shed his agrarian trappings, flee the silo and head out onto the battlefield, by morphing himself into a war-god, an image which would eventually inspire his people to world conquest. This remarkable leap from farm to foxhole saved him his divinity. As the Romans rose to international pre-eminence, the social pressures accompanying their stunning successes in foreign wars forced dramatic changes on what was once a small farming community. It wrenched open the Romans’ minds, along with their temples, and paved the way for an influx of new ideas and deities. First and foremost among these were the Greek gods, whose celestial authority in origin rested on theological foundations no sturdier than the native Roman gods’—in early Greece, Zeus and his Olympian comrades were certainly no less provincial in outlook—but their continuing presence in popular literature, particularly in widely read authors like Homer and the Athenian tragedians, did much to advance the popularity of the Greek pantheon around the Mediterranean world. That program of outreach went particularly well in Rome. With that came the famous equation of Greek and Roman deities, a fabrication concocted by early Latin authors seeking to aggrandize their native divinities by associating them with well-known Hellenic god-heroes whose exploits filled legend and myth. Thus, Jupiter added “Zeus” to his vita, Juno added “Hera,” Mercury “Hermes,” Mars “Ares,” Venus “Aphrodite” and so on, even though in several cases these equations were based on very little. And once the Greeks had finished inoculating Roman temples with their clones, the rest of Rome was a veritable open door, a freeway for foreign distractions. But much of this religious revolution was, in fact, superficial, a change of name but not core values. Indeed, if any enduring “theology” guided early Rome, if there was an abiding moral principle that governed the burgeoning super-power, it was patriotism. As some in today’s world are raised on Biblical stories which preach lessons about life, ancient Romans were nursed on tales of sacrifice to the state, a veritable litany of all the joys and comforts their forebears had denied themselves in the process of founding and defending the Republic. One such legend revolved around a man called Cincinnatus—the modern city in Ohio gets its name from him—who, according to Roman tradition, was out plowing in his field when a report arrived that an enemy was at that very moment invading the land. Upon hearing this news, Cincinnatus set down his plow, picked up his sword and led the counter-charge which defeated this foe. He then returned home to the “triumph” of finishing work on his field. Farmer and soldier and legend perhaps, Cincinnatus served as a model to all little Romans for how to spend your sweat and blood, for what to believe in, for what to love above all. This patriotic “religion” promoted virtues like bravery, honor and duty—and the reverence of ancestors and tradition—all values by which the early Romans set great store. But beginning in the last quarter of second century (ca. 130 BCE), this credo of self-sacrifice in behalf of the state began to ring hollow after a succession of power-hungry generals, men like Marius, Sulla, Pompey and Caesar, sought to use Roman government and military might for their own good more than Rome’s. With this, the Romans’ sense of patriotism slowly bled to death on the altar of personal self-promotion, and along with it went the habit of sober conservatism and all the qualities the religious zeal for Rome had advanced. Conquerors of the known world, the Romans now stood theologically naked before all, weak and ill-equipped to fight off foreign influences within their own state. Having wolfed down so many cultures, they were now compelled to digest them. Individual Romans’ reactions to the horrors of a century-long civil war (131-31 BCE) varied widely. With no effective moral authority to stop them, some turned to license and debauchery, some to the solace of literature and philosophy, others to the comforts of self-indulgence in food or gardens or collecting political honors without real power, and some—though distressingly few!—remained staunchly conservative, in the words of Rome’s greatest poet Vergil, antiquâ sub relligione (“beneath their ancient faith”). But for all their differences, these desperate measures were each a sort of psychological life-boat and shared one thing in common: in one way or another, they were all foreign to Rome, either coming from outside native Italic culture or grossly out of place in their day. In fact, in their day there was no Rome, not by the first century BCE at least, only Romes. Somewhat ironic, then, were the efforts of the early emperors who inherited the reins of Roman government after the fall of the Republic (31 BCE). Their attempt to unify Rome under a single system of worship by merging of state and religion in a belief system which today is called emperor-worship combined the raising of revenues and exaltation of souls into one convenient monthly payment. Many a Roman lover of freedom who looked wistfully back to the days of private independence under the Republic must have noted snidely that the emperors were the very reason Rome was no longer unified because they had undercut Roman patriotism. But tyrants can afford to ignore the public and impose harmonizing measures unilaterally. After all, when a single person controls everybody’s destiny, who’s to say he’s not a god? And shouldn’t gods be worshiped? Thus, temples dedicated to potentates du jour rose all across the Empire, fixtures where people were expected to visit and pay their just and due respect, or just their dues. 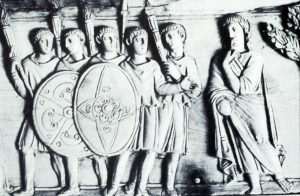 When a good emperor like Augustus or Hadrian strode across Roman domain, emperor-worship actually made a small semblance of sense, but if the throne harbored some drooler like Claudius or a sadist of Domitian’s ilk, it was more difficult to squelch the common laughter as these “deities” were paraded up to heaven. And the latter was the case more and more as time went by. Indeed, as the list of emperor-deities grew ever longer—and ever weirder—this nova relligio (“new religion”) began to look like just another form of taxation, which is in fact exactly what it was, and who’s going to worship a tax-collector? Everyone knows you swear at tax-collectors, not by them. Thus, amidst moral chaos, multicultural exchange and vain attempts to keep the heart of primeval Rome beating, the Christian movement was born. Despite a citizenry chasing a thousand different dreams, the burgeoning Roman Empire still achieved a remarkable degree of peace, if not quiet. What’s more, the Romans of the late first century BCE remained remarkably tolerant to diversity, allowing people to pursue whatever cults and philosophies they wanted—as long as they didn’t foment rebellion or interfere with state business—it’s a basic tenet of polytheism that worshipers have the license to collect and collate whatever beliefs they wish, a sort of cafeteria approach to religion. Over the course of the next few centuries, Christianity would change all that and bring to the forefront a new order built on both innovative principles and traditional values—and fewer choices. 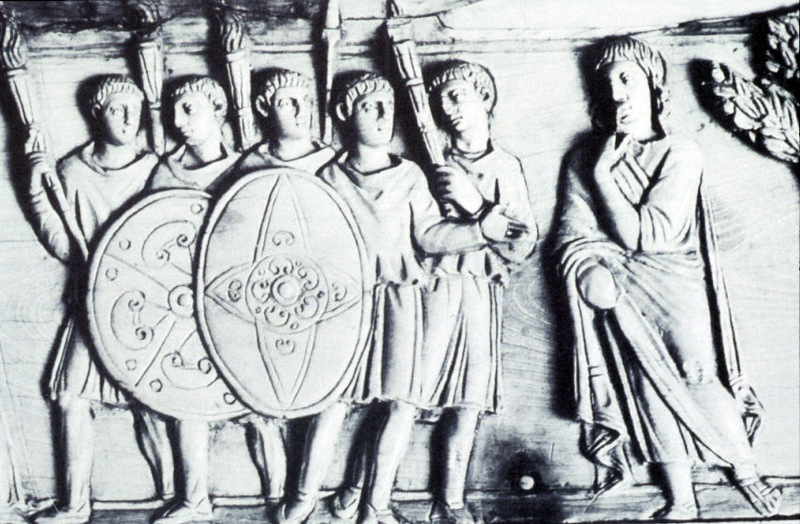 The Christians were far from the first foreign sect to make its way to Rome. Others came earlier and played better to the Roman crowd, at least initially. The popularity of these rivals reveals much about the Christians’ ultimate success, because it lays bare the religious predilections of the Romans in the day—that is, what in general tended to attract them in a belief system—and the steps which drew their eye to Christian worship. One of the oldest cults imported into ancient Rome was that of the earth-mother goddess Cybele. Originating in Asia Minor—the Near East incubated many new religions in antiquity—Cybele entered the Roman sphere at a critical juncture in history. In 205-202 BCE at the close of the Second Punic War, the Romans narrowly defeated Carthage, their rival for control of the western Mediterranean region. Bloodied but victorious, the state felt it owed some measure of that victory to Cybele, since, according to Roman historical records, it was on the advice of an oracle that her worship had been imported to Italy, only a few years before the Carthaginians’ defeat. Rome at that time had other good reasons for adopting this goddess’ cult. For instance, one of Cybele’s major attributes was that she protected people at war and, as such, was often shown wearing a crown of city walls symbolizing the defense she offered adherents. 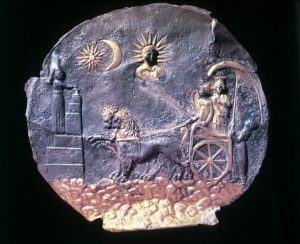 Also, as an earth-mother deity in origin, she bestowed fertility and governed creatures of the wild—ancient portraits show her riding in a chariot pulled by lions—and in both aspects she appealed to the Roman public whose lifestyle was still, for the most part, agrarian. Besides that, her powers included the ability to cure disease and predict the future, making Cybele an all-purpose deity if ever there was. And so the Romans flocked to her cult eagerly, at least at the outset, but when they got a closer look at what this goddess’ worship entailed, what she asked in return for her bounty of blessings, many drew back in shock. The rites of Cybele revolved around not only the goddess herself but also a young male consort of hers named Attis who was said to die and be reborn annually. That is, myth held he perished each fall and returned each spring, an obvious reflection of plants and vegetation. The way Cybele’s adherents celebrated his renewal and restoration involved much lamentation and also wild behavior, ecstasy to put it technically—ecstasis in Greek means literally “standing outside (oneself),” in other words, the transportation of a person out of his or her body which allows spirits to possess it, much the same way mediums at séances act today—and worse yet, during her rites, worshipers produced this feeling of ecstasy by dancing and carousing, whipping themselves into a frenzy where they felt elated, in Latin “carried away.” At times this involved scanty clothing and mixed company. A traditionally conservative people, most Romans took a dim view of such behavior. The Roman Senate was repulsed enough at this purported worship to issue edicts condemning and criminalizing its bacchanals. So, in spite of their gratitude to Cybele for her help in defeating the Carthaginians, this was just not a way the majority of Romans were willing to comport themselves. Still worse, the priests who oversaw Cybele’s worship were eunuchs, men who’d been castrated when they joined the cult. That was definitely not something Roman mothers dreamed of for their boys. But the advent of Cybele had opened a door that wouldn’t stay shut, and no senatorial edict or general disapprobation could stop the cult from growing. Besides its impressive debut, its attractions were great and manifold. First of all, it preached a doctrine of life-after-death, a promise to all its faithful of immortality through union with Cybele in the beyond. To many that was very enticing, especially those with little hope for success in this life: slaves and women and the working classes of Rome. Also, its vegetation-oriented imagery resonated well amongst a populace that was still deeply connected to the land. At the same time, however, the Romans had many other boxes to check on their menu of religious choices, indeed more and more as time went by and the gates of Rome were welcoming the world. So, instead of toning down their ecstatic behavior in accord with governmental injunctions, the officiators of Cybele’s cult introduced increasingly licentious rites. They had to, really, if they wanted to keep their ratings up. After all, what else can a network do to stop people from changing channels? Government fines and restrictions on “indecency” often add up to cheap and effective publicity. A very different Roman cult, one much less manic and more attractive to the prim-and-proper set, found a way to answer that question. 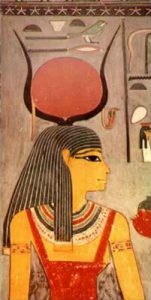 Among the principal Egyptian divinities and characters in myth is Isis, a goddess with roots about as deep as they go in Western Civilization. Her name occurs on documents dating to the third millennium BCE. Both wife and sister of Osiris, the prototype of deceased pharaohs, she was said to have restored her husband/brother to life after death. 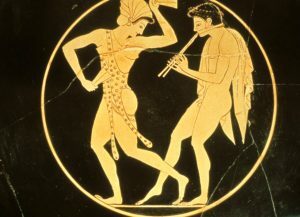 By Roman times, then, this ancient myth had already seen many different cultures come and go, and the result was that, while the core of Isis’ story never changed, its details did significantly, as indeed they had to, given her cult’s obligation to appeal to so many different times and tastes. One of the ways it had remained abreast of developments in ancient society was by equating her with other deities, both Egyptian and foreign, making her quite literally a goddess “invoked with innumerable names,” a direct quote from an ancient hymn to Isis. Thus by the first century BCE, she was hardly Egyptian at all, or at least didn’t always look that way. In part, that’s because Isis was especially popular among Greek sailors who by the time of Christ had spread her worship around the Mediterranean. In this Hellenized form, she had grown into a universal symbol of renewed life and fertility, and like Cybele, there’s almost nothing she wasn’t at some point somewhere to someone. Thus, with no clear image or guiding principle and, what’s worse, worshiped in secret rites called mysteries, Isis had come to be everywhere and nowhere at once, both universal and hidden. With that, it’s hard for scholars today to grasp what exactly she represented to the Romans or why her worship was so popular, other than the usual reasons mystery cults like hers have appeal. That is, belonging to a club with a secret that only a chosen people know is a perennial formula for popularity. The fact is, everybody loves a riddle, everybody except historians trying to figure out what Isis is all about. We do, however, know a few things about her cult, for instance, that it featured several levels of achievement, much like modern Masonic rites, but we’d like to know much more. 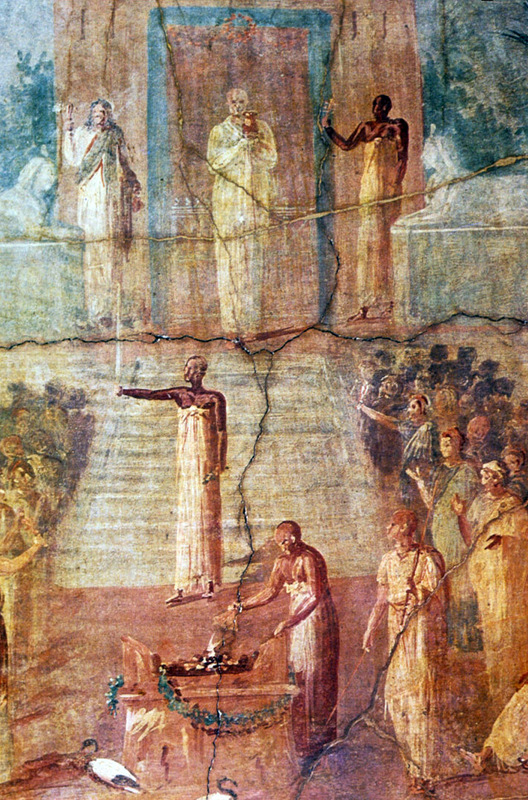 Even with the discovery in Pompeii of a wall-painting depicting the performance of a ceremony in honor of Isis, it’s still unclear what rituals this cult entailed and their significance. In this fresco, for instance, we see a cistern of Nile water, choruses lined up singing, music and elaborate pageantry, but how all that fit together and what its message was is the real “mystery” of Isis today. Despite that uncertainty, it’s clear that many people across the Roman world embraced this cult, in particular, women and especially those who cherished decorous behavior, unlike their sisters who enlisted with Cybele. But like many of her religious rivals, Isis also promised her worshipers immortality and personal communion with the goddess. This commonality must signal something greater, a need within the Roman populace to feel independent and free-thinking, to make a choice of one’s own, to matter as an individual—the growth and success of imperial Rome surely left many with the sense that they were just cogs in the machinery of Roman society—if so, this flagging sense of personal worth was a factor every cult surely had to deal with one way or another, including Christianity. Another Roman cult of foreign extraction—and one about as mysterious as Isis’—was that of Mithras. A riddle in so many ways, how this sect arose is even in question, though one scholar today may have found the answer. 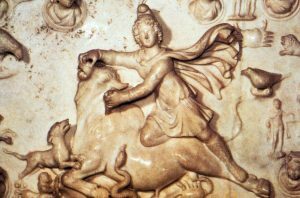 In its art and iconography, the worshipers of Mithras have left behind clues about the rise and nature of their religion, and through careful examination of the data historians have perhaps discovered the key to unlocking this most mysterious mystery cult. The name “Mithras” has deep roots in Western Civilization. It’s listed among a catalogue of gods whom the Indo-Iranians worshiped, the Indo-European group that settled the Iranian plateau east of Mesopotamia around 2000 BCE. “Mithras” appears again over a millennium later as the appellation of a secondary Zoroastrian deity in Darius’ day. Finally, this name is also attached to a god whose cult thrived in the Roman world beginning just before the time of Christ and for centuries after. The connection linking all these different Mithrases, seen in places so distant from each other and across gaps of so many years, is hard to reconstruct. All the same, the name by itself suggests some sort of affinity. Nor is the evidence for any of these Mithrases bountiful or easy to interpret. The first two are all but impossible to see historically: the former existed in very remote times and a place from which few historical records survive, and the second was not the principal deity of the religion to which he belonged. Though hidden behind the veil of a mystery cult, the last is the best attested, since this god rose to prominence during the final days of the Roman Republic, the comparatively well-documented first century BCE. As the only “Mithras” whose history we have any real chance of uncovering, he has been the focus of attention among scholars. Ancient chronicles tell us that a god with the name of Mithras was imported into Rome around 60 BCE through contact between the pirates who lived in the seas around Asia Minor and the soldiers of the Roman general Pompey who’d been sent to exterminate them for disrupting trade in the region. After arriving in the capital, the cult spread quickly and widely among Roman men, primarily soldiers and merchants—there are very few aristocrats recorded as devotees of Mithras—and as far as we know, no women of any class were ever party to this god’s rites. Because it was a mystery cult, our understanding of Mithraic religion derives mainly from archaeological evidence and, fortunately for us, quite a bit has been recovered. 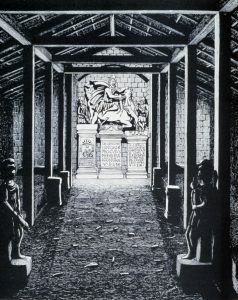 Over four hundred Mithraea (singular, Mithraeum), the temples in which the rites of Mithras were celebrated, have been found, the majority of them in two places: around Rome and its port city Ostia, and along the northern frontiers of the Roman Empire formed by the Rhine and Danube Rivers. This geography ties in well with the no-women, no-nobles feature of Mithras worship attested elsewhere, because the city of Rome and the frontiers of the Empire were places where working-class Roman men lived in sizeable numbers. Besides that, virtually all Mithraea share certain features. To us today, these are important clues about the rituals once performed there, the password perhaps that lets us in on the secrets revealed to initiates of the cult. For instance, all these “caves”—”caves” is how Mithras worshipers referred to their holy sites; the term “Mithraeum” is a modern invention—are long, narrow, underground chambers outfitted with benches, an altar and enough room to lay out a meal. From this, it’s safe to suppose initiates feasted on a ritual dinner of some sort. This holy supper is depicted in Mithraic art, though the significance of the banquet is unclear. We do know something about the initiation ceremony, however, for instance, that it involved baptism in blood, perhaps bull’s blood, because bulls play an important role elsewhere in the religion. Virtually every Mithraeum uncovered so far contains a representation—it can be a painting, a relief or a statue—of Mithras slaying a bull. Called the tauroctony (in Greek, “bull-slaughter”), this ritual image is remarkably consistent wherever and whenever this third form of Mithras worship was practiced. It is also worth noting that Mithras is always depicted above the bull, sometimes kneeling on the bull’s back, reaching down with a dagger and stabbing it in the flank. The bull’s blood runs down to where a little dog is lapping it up. In addition, behind the bull is a scorpion which is often climbing up its back leg. Finally in many pictures a snake slithers by. Here the mystery offers up tantalizing clues about the religion represented through this art. For one, most of these images are tied to constellations: Taurus the bull, Scorpio the scorpion, Canis minor the dog, Draco the snake. To drive the point home, several pieces of Mithraic art depict the sun and moon as well—in one, Mithras is even shown dining with an image of the sun—indeed, everything about these works is astronomical, except one thing: Mithras, the central figure! Why is a Persian deity from remote antiquity depicted in the center of classical Greek constellations, a much later invention? While it’s true that in his earlier incarnations, especially in Zoroastrian religion, Mithras was associated with the sun, no tauroctony is ever mentioned there or anywhere in pre-Roman Mithraic legends. Nor is there even the slightest hint in Persian accounts of Mithras killing some celestial bull. How is it possible, then, to reconcile the Mithras we see in Rome with his earlier synonymous counterparts? If the answer lies anywhere, it must be in the stars, so perhaps it’s time for us to consult our personal astrologer. To the ancients, the stars were truly guiding lights, maps to the future if you knew how to interpret their movements. 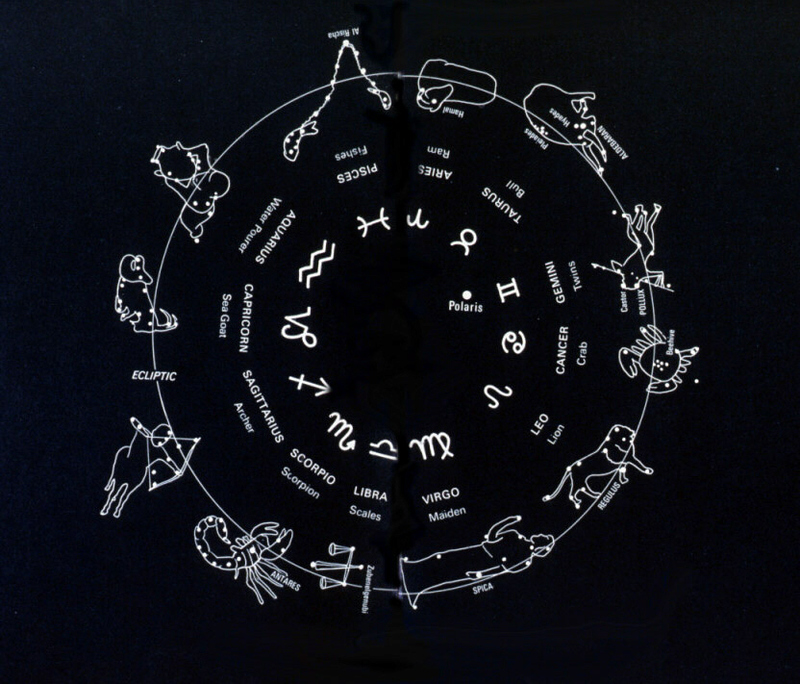 As such, one of the most pervasive and enduring influences in ancient life was astrology, a form of divination which rests on the premise that, by studying the movements of celestial bodies, it’s possible to predict affairs in the human sphere. Because the ancients believed that the powers controlling all things above and below dwelt in the sky, it seemed logical to them that anyone who could “read” the stars and planets should be able to forecast the future. After all, why else would the heavens move, if the gods were not trying to send us some sort of sign? This notion can be traced back as far as Mesopotamian culture in the second millennium BCE. From there it spread to Egypt, and later to Greece and, finally, Rome. Engendering a dangerous and potentially destructive fatalism, a sense that whatever happens was fated to because the gods control everything—so it’s not your fault when things go wrong!—astrology grew in popularity among the ancient Greeks, especially after the ravages of the Peloponnesian War (431-404 BCE) and, worse yet, Alexander’s conquests (336-323 BCE). It played well into the view espoused widely in the third and second centuries BCE that the gods were distant and uncaring, either having some great plan to make a better world but unwilling to let us in on what it is, or they were insufficiently concerned with humanity to stop scoundrels and barbarians from destroying everything good. Despite its dismal view of life, this was to many who survived Alexander’s ravages a perspective that accurately reflected their day. Such morbid self-pity compounded with the teachings of astrology turned many eyes from earth to heaven. For the first time in Western thought, it became generally accepted that souls ascended upward after death, instead of being crowded down beneath the earth in some dank hole designed to corral the dead, a hell or hades or she’ol. Another result of this thinking was that the planets or “wandering stars”—planetes means “wandering” in Greek—began to be associated with the Greek gods, and later their Roman equivalents. From that come the names familiar to us: Mercury, Venus, Mars, Jupiter and so on. 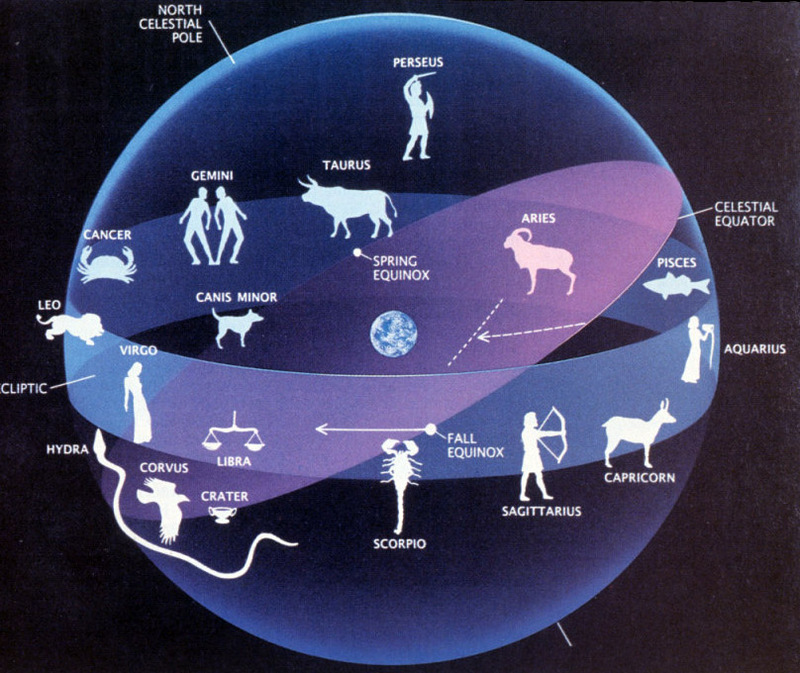 Astrology enjoyed immense popularity in antiquity, crossing all levels of society from peasant to emperor. It was the one ancient belief-system no political or social adversaries, be they pagan or Christian, were ever able to eradicate, or so Diocletian, Justinian, several Popes and a raft of other powerful sovereigns eventually learned. In fact, while temples of Venus or Isis or Thor are hard to come by in our times, it’s still possible to read one’s horoscope today. 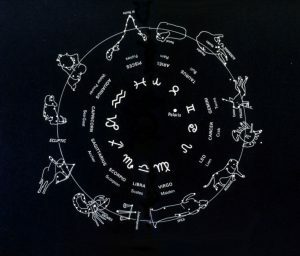 The enduring appeal of astrology rests, in part, on its ability to address simultaneously both the individual and the world at large. And even more important, it presumes the powers-that-be care enough to inform us about their will and their plans for the future, even if it is in some starry, garbled code. That eternal connection, the universe’s expression of infinite compassion toward you and me and every other individual on earth, is what made—and still makes!—astrology so compelling and attractive, especially during those “interesting times” when just listening to the news can be a shattering experience. 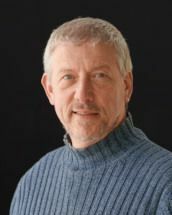 In a brilliant piece of historical detective work, David Ulansey has pieced together many of the facts known about the Mithras cult and come up with a fascinating, possibly even correct hypothesis which appears to solve the riddle of the Mithraic mysteries. Avoiding what has bedeviled so many attempts to explicate the history of this religion, he begins from a novel premise, that the three different Mithrases—that is, the Indo-Aryan, Zoroastrian and Roman incarnations of the name—were not all the same deity or part of the same religion. Instead, he proposes that for some reason the Roman god merely re-used an ancient and venerable name, perhaps for the simple reason that it was ancient and venerable. 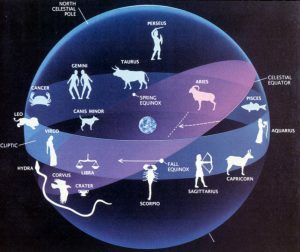 Then he focuses on the astrological elements so prevalent in the iconography of the cult and suggests they are related to an astronomical phenomenon which today is called precession. Precession is the apparent movement of the sun very slowly backwards across the heavens, meaning that the sun seems to creep around the celestial dome in a direction opposite to the motion of the stars. Of course, the sun does not revolve around the earth, as the ancients supposed, so, in fact, it is not the sun that’s moving but the earth which is wobbling on its axis as it rotates, the way a top rocks around in circles as it spins—it’s easiest to understand this if you imagine looking down on our planet from space—precession is an effect produced when the direction in which the earth’s poles point moves slowly in a circle over time. But because it’s happening on such a enormous scale, celestial precession is very slow—the earth takes 25,920 years to complete one full “wobble”—which makes it impossible to detect without both careful measurement and a long and accurate historical record of the position of the stars in the heavens. But by the Roman period, ancient astronomers had exactly that. Since early history, the Mesopotamians had kept careful diaries of planetary movements, solar eclipses and the like. Enough of a record existed that Hipparchus, a Greek astronomer living in Asia Minor around 125 BCE, had discovered the fact of precession. From the geocentric perspective, the precession (a movement of the earth) appears to be a movement of the entire cosmic sphere. For people who held both a geocentric world view and the belief that the movements of the stars influenced human fates, the discovery of the precession would have been literally world-shaking: the stable sphere of the fixed stars was being unseated by some force apparently larger than the cosmos itself. Ancient intellectuals, accustomed as they were to seeing the work of the gods reflected in the works of nature, could easily have taken this great movement as evidence for the existence of a powerful, hitherto unsuspected deity. Extending that tendency back in time shows that the sun moved from Aries to Pisces in the early first century BCE, and from Taurus to Aries about two thousand or so years before that, around 2200 BCE, or to put this in astrological terms, ” the sun moved out of the house of Taurus” around the turn of the third millennium BCE. According to Ulansey’s thesis, the timing of this precessional shift is no coincidence; rather, it is the secret revealed to those initiated into the Mithraic mysteries. The iconography visible in the remains of Mithraic art supports this case, and for the first time since the Roman age it has clear meaning. Mithras kills the bull (Taurus) as the constellations around him watch (Draco the snake and Canis Minor the dog). On the other side of heaven, Scorpio, the sign exactly opposite Taurus in the zodiac, climbs up the bull’s back leg. 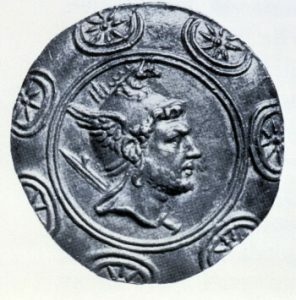 The tauroctony, then, represents Mithras as the “powerful, hitherto unsuspected deity” who moves the sun out of the “house of Taurus” by slaying the bull, its sign. The painting of Mithras dining with the Sun serves only to bolster Ulansey’s thesis further. But one key piece of the puzzle is missing, the same one that’s been absent all along: who is Mithras? For all the ways and times this name has been tagged onto some divinity, no constellation in any civilization’s star-charts is called “Mithras.” As before, perhaps the answer to this final riddle lies not with the deity himself but in the heavens. If the god’s position is always above the bull—and it’s worth remembering in all the surviving representations of the tauroctony Mithras never stands anywhere but directly over the bull as he’s killing it—then the constellation above Taurus ought to carry some significance. And so it does. It’s the Greek hero Perseus, the mythological warrior who, among other heroic labors, slew the Medusa, the snake-haired demoness whose mere appearance turned men to stone. 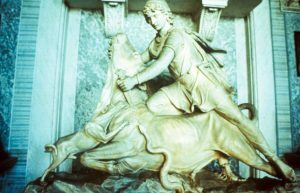 Ulansey suggests that Mithraic religion equated Perseus and Mithras—pairing up divine figures from different cultures was a common tradition in the classical world, as we saw with Isis—and along with the mysteries of precession, that was another secret initiates learned upon their induction to the Mithraic cult. When all these clues are put together, several pieces of the riddle fall into place. Around 125 BCE, the Greek astronomer Hipparchus living in Asia Minor discovered precession and, according to the thinking of his day, unveiled a universe reeling backwards under the influence of some sort of cosmic power. From that was postulated the presence of some new deity, or perhaps an old one recognized long ago in a previous time during which the sun had changed “houses” before. When calculations showed that the last transition of the sun from one house to another, from Taurus to Aries, had happened around 2200 BCE, there must have been a mad scramble for ancient cuneiform tablets in a desperate search for this god’s name. And, indeed, research into remote Mesopotamian records brought to light a god who’d been connected with the heavens back then—no doubt, the interceding Persian deity known from Zoroastrian religion in Darius’ day had helped to preserve the name Mithras across the centuries—but after two millennia little more was known about this Indo-Aryan god than his alias. Thus, the recovery of the name “Mithras” must have been somewhat of a disappointment, yet in some ways that was all to the good, since it left room for a whole new system of stories and images to grow, for a mythology to accrue around this recycled divinity, a religion that seemed not only ancient but could also be expressed in modern astrological terms and packaged as science, the way science was understood in the day. Because it’s never wise to be too novel with the public, especially in matters of life and death which are the basic currency of religion, the obvious solution for the authors of this new-and-old Mithras cult was to link their deity with something generally familiar, a hero like Perseus who was already well-known, had even been sent into heaven and identified as a constellation by that day. And fortuitously Perseus was near Taurus in heaven, almost directly over it in fact, a coincidence which almost demanded the story that he’d slain the bull from above. The authors of Mithraism must surely have asked themselves if all this—the timing of the precession, Mithras’ name in ancient texts, Perseus’ presence next to Taurus in heaven—was really just chance. To them, it must have seemed like the stars were handing down some new secret truth, both a mystery and a religion, but then that’s the way things often look to pioneers of faith. With this, the time, the place and the players make remarkable sense, and that’s not all. Further confirmation of Ulansey’s theory emerges from close examination of what is known otherwise about life in ancient Asia Minor at this period. While in general Greek mythology Perseus is little more than a mortal hero, he was worshiped as a god in Asia Minor which would have made his equation with Mithras all the easier in that part of the ancient world. And finally, because astronomers at this time knew the next precession would happen soon thereafter (before 100 CE), the impending shift in the heavens—the sun moving from Aries to Pisces—can only have added fuel to the cult’s fire, giving its adherents something to anticipate and focus on. Indeed, Mithras worshipers gained increasing attention in Rome, especially from the first century CE on, exactly the moment when the sun’s change of “houses” was taking place. Thus, according to this line of reasoning, Mithras was a god cobbled out of used parts and flung into the heavens to kill a bull and wrench the universe backwards. 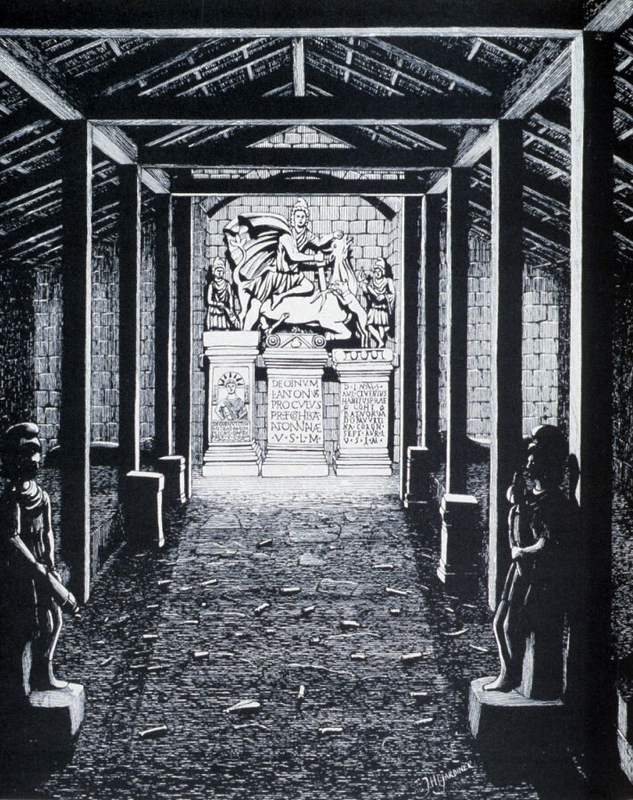 This scenario harmonizes so well with the known data about Roman Mithraism and operates in such close accord with standard religious practice in antiquity, especially the way it interlards old and new and extends what a culture already embraces, taking its devotees in innovative directions, but at the same time keeping its truths in trust, the privilege of its initiates—it all makes such basic sense it’s hard not to believe Ulansey’s thesis is correct. If so, it’s little wonder this religion burst out of the gates as fast as it did. It was built like a theological rocket aimed at the very heavens it purported to unfold. But a fast start doesn’t always mean a long trip—look at Akhetaten!—and this cult is a good case in point. Mithraism ultimately burnt out, along with many other cults and the Rome to which they played so brilliantly, and yet at the same time that these religions were fizzling, Christianity’s fire sparked to life and blazed. What made the difference between life and death? Why did one triumph where so many others failed? So, one central question facing historians is how and why the worship of Christ prevailed over that of all the other deities competing for attention in imperial Rome. While parallels can be found here and there, the religions of Mithras, Isis and Cybele do not, in fact, resemble Christianity very closely. To wit, if Mithras is said to have inhabited the heavens just like Christ, and Isis to have promoted austerity and chastity, and Cybele’s consort Attis to have died and been reborn in glory, these add up to little more than a few superficial similarities, vastly outweighed by the profound differences distinguishing any of these four from the others. To answer this question, it’s necessary to look outside of this quartet for a deity who shares more than one or two random attributes with Christ. If such a god exists, it will help us not only understand better the religious predilections of the public who eventually endorsed and adopted Christianity but may further illuminate why the proponents of Jesus highlighted particular aspects of his divinity. To put it in modern advertising slang, we must try to uncover what “sold” the Roman populace on Christ. It does not, in fact, require much of a search to find a god in the Roman world who shares many more features with Christ than Cybele, Isis or Mithras. Dionysus, who we are often taught is Greek but whose cult actually arose in Asia Minor, is attested more than a millennium before Jesus’ lifetime, by 1200 BCE at least. Subsequently imported to Greece, his worship entails a myth which bears striking resemblance to the life of Christ as recounted in the Bible. In particular, Dionysus’ “biography” involves an unusual intermixing of the mortal and divine spheres, a peculiar blending of history and myth. While the ancient Greeks called him “the son of Zeus,” at the same time his myths are set against a backdrop that is very close to their conception of what-really-happened in remote antiquity. In other words, unlike many of his Olympian peers, Dionysus was believed to have lived in a realistic past of sorts, or at least not one seen as imaginary the way many other Greek myths were, such as the tale of Cronus eating his children or the war between the gods and the giants. 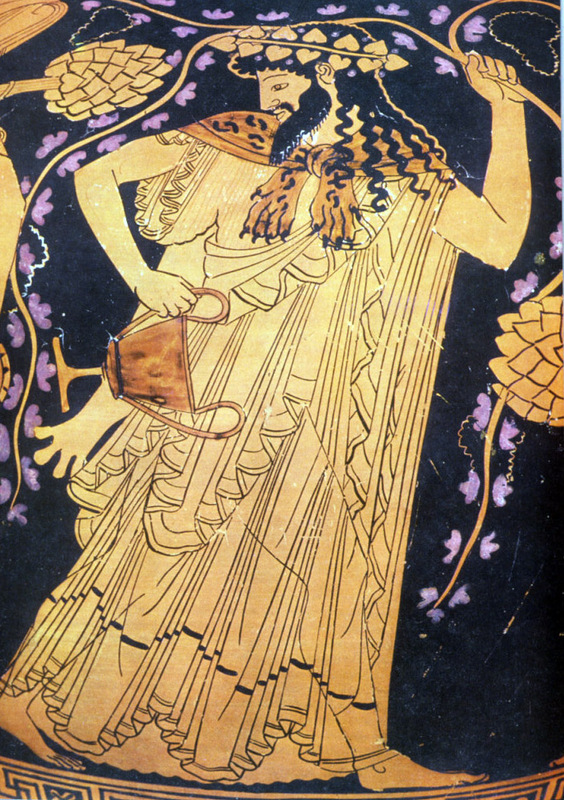 Like Christ, Dionysus is a god whose story is set inside a more historical framework. Dionysus and Jesus share other characteristics as well. Both have mothers who play a crucial role in their religion, and their worship centers on the expression of strong emotions, bordering on hysteria at times. Also like Christ, Dionysus is most often portrayed as a bearded young man, who promotes “love” in others yet did not often participate in amorous or sexual business himself. Moreover, the myths surrounding the Greek god center on his humiliation at the hands of cruel, benighted mortals, another close parallel with Christ’s life. In some variations of Dionysus’ “biography,” he’s even brutally killed by his enemies, only to be reborn and triumph over them. Keeping this mythic archetype in mind, let’s turn our attention south, from Asia Minor to Judea, a world in which the Hebrews had long been oppressed by a series of tyrannical overlords: Assyrians, Babylonians, Alexander, his successors, and finally Rome. From this, it’s easy to see how a fervent hope for independence promoted the notion that God would one day bring redemption and revenge. Just as with the myth of the Maid of Lorraine which vaulted Joan of Arc to prominence many centuries later, the Jews’ dreams of liberation came to be expressed in human form, in the shape of a rescuer they called the messiah, literally in Hebrew “the anointed one.” In Greek that’s christos. Add to this a pinch of Greek philosophy, a belief-system of sorts but seasoned with logic, not emotion. Ancient philosophical systems were filled with buzzwords like logos, meaning in Greek “word,” the term the early Greek philosopher Heraclitus had used to define what held the universe together. Scholarly jargon of this sort filled Jewish ears in those days, since many Hebrews at that time—and every prominent one—understood Greek. It was also the common tongue shared across the Near East, another of Alexander’s legacies, which is why the New Testament was written in that language, to give it an appeal as wide as possible. Put all these ingredients together—a god that dies and is reborn like Dionysus or Attis, the Jewish hope for a messiah and Greek intellectualism—stir them for a century or two over a seething cauldron of cultural unrest, and the resulting religion will probably look something like Christianity. If this seems like a rather callous take on one of the most significant movements in Western Civilization, there’s nothing casual or flippant about pointing out how hard it is not to conclude that the authors of Christianity followed some sort of recipe for success in their day. Moreover, that the entree they eventually served tasted as good as it did to the Romans crowding the buffet of beliefs where they picked and chose among a wide range of cults argues strongly that its leaders grounded their efforts to build a new religion in a profound understanding of the culture they inhabited—and not just the Jewish world either, but the Greek and Roman worlds as well—for from their genius emerged a theological system with a powerful and immediate, if not immediately powerful, impact. So Christianity entered the drama of ancient life—and, in particular, Roman urban culture—rather late in the play. Onto a set already stacked to the ceiling with ecstasy, astrology, mysteries and emperor-gods, the first Christians found little room to sit, much less maneuver. Still, in carving out a space that marked them as different from their many religious rivals, they somehow secured a niche, a very small one initially, and in what must be seen as most remarkable about their rise, especially given how little they had to work with at first, they survived their religion’s birth and infancy and ultimately found a way to take center stage. That makes it very important to understand all the things working in Christianity’s favor, the succession of wise long-term decisions made by a succession of Christian leaders in the religion’s seminal period. Clearly, its savvy architects not only assessed the evolving climate of Roman culture with great insight—not to mention foresight—but also understood well how to avoid the fallacies that eventually stifled and strangled their rivals. •And though full of mysteries, Christianity never promoted itself as a mystery cult like Mithraism or Isis worship, where the primary appeal to the initiate, the knowledge of a “secret” shared by few, kept later advocates from being able to spread the cult’s “gospel” freely in public. Early Christian leaders surely saw that, even if their movement was slow on the uptake, in the long run it was better not to create a members-only club. •And in what was perhaps their wisest decision of all, Christian leaders kept up their contacts with each other and didn’t allow their religion to fracture as badly, for instance, as Isis worship had. Paul’s letters must have served as an important model for those ambitious to keep Christianity globally integrated. This tradition paid off well later when the religion had become widely practiced and popular and, as such, naturally inspired all sorts of debate, the first slippery step toward schism. Though Christianity ultimately did fragment, and seriously—several times, in fact—there was never any sense among its early advocates, nor has there been much since, that division is acceptable and should be tolerated. But division, we must remember, is the very essence of polytheism, as is the recognition that other religions bear their own validity. From its Judaic roots, Christianity inherited a very different view from this à la carte mode of worship, the notion of exclusivity. It was surely a novelty to most Romans, the idea that converts must abandon all other forms of worship when they embrace Christ. That insistence on imposing a definitive choice with grave and irreversible finality seemed to many, no doubt, an unreasonable burden to place on prospective adherents, an especially perilous tenet for a young and vulnerable cult to adopt, but exactly the opposite proved true. Demanding exclusivity turned out to be a brilliant way of playing the historical moment. Many Romans, stuffed with all manner of worship and stripped of free speech—which means also free thought—by an increasingly necessary but ever more despotic succession of emperors, sought ways to assert themselves as individuals, some choice they could honestly call their own. And of all it offered, that freedom to choose is what Christianity delivered best, a vindication of one’s personhood, a way to spit in the face of society’s disdain. And there’s no better evidence of that than the sorts of people to whom the religion at first appealed: slaves and women primarily, as well as others from Rome’s vast census of minorities, those who had little or no freedom of choice otherwise. Reeling in the top, the power-brokers, the men in charge, that would take longer and require some modification of policy, which is precisely where history takes us next. This entry was posted in History, Religion. Bookmark the permalink.